My first brush with Manto was purely accidental. A couple of years back, it so happened that in a reading group on Facebook of which I am a member, someone had posted a google books link of a particular Hindi book of Manto. Until that day I had never read a Saadat Manto work before. Nor did I have the faintest of idea who Manto was. Upon following the url link that was shared on the Facebook group, I got to read an excerpt of one of his short stories. It was so engaging that I wanted to read more of his literary works, my curiosity about Manto had been piqued like never before. It was only natural that I would Google about him and so I did. The more I came to know about his controversial writings, the more curious I became to read his stories. Now it was a question of choosing which one to read first from among the many English translated compilations of his stories and I zeroed in on 'Bitter Fruit : The Very Best Of Saadat Manto' compiled by Khalid Hassan to start with. 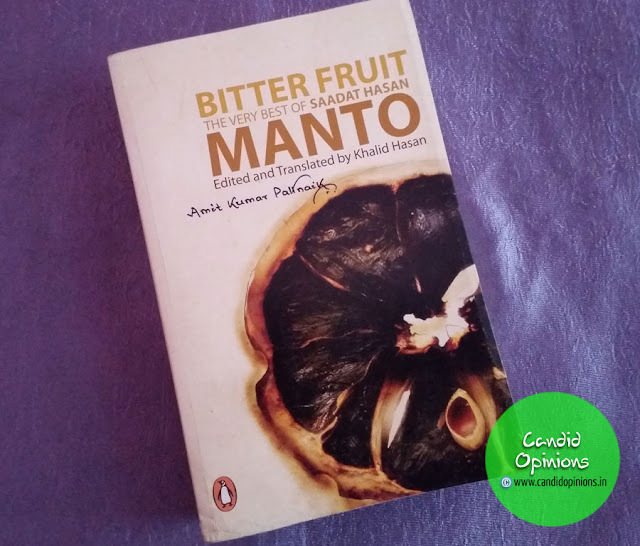 Since it was the first time that I was reading a Manto work, I had no idea what to expect and that sometimes helps, not to have any pre-conceived ideas about an author or his writings. However the very first story in the book was a put off, and I became skeptical about what to expect in the subsequent stories. But I continued to read and boy, was I not mighty impressed? This compilation has some truly amazing stories, written with unflinching honesty that also give the readers a peek into the turbulent times of India's partition. The stories were originally written in Urdu and Khalid Hassan has done a wonderful job with the translation. It is often said that the essence of the original work is often lost in translation but after reading this book, I was left wondering whether it was the class of Manto or was it because of the superb narrative skills of Khalid Hasan that left me spellbound! There is a certain verve in the narration, there are clever suggestions and plenty to read between the lines.. and most of the stories (some 55 in all, if I am not wrong) are bold and daring, provocative and combative, smart and sassy, reflective and insightful. In short, the stories are worth a read.